The Goodrich family is a strong supporter of beef activities and the MN Beef Expo. We feel our heifers will provide a great opportunity for young people to further their beef experiences and expand their knowledge of the beef industry. 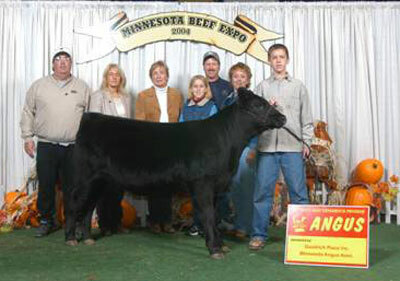 For further information, visit the Minnesota Beef Expo Web site. 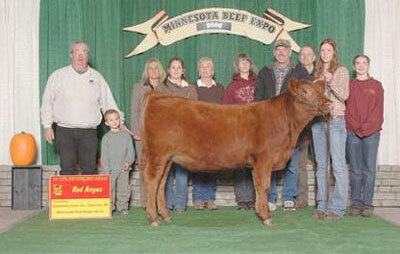 Hannah Bolduan from Caledonia, Minnesota, received the 2011 Red Angus heifer donated by the Goodrich Place Inc. on behalf of the Minnesota Red Angus Association. 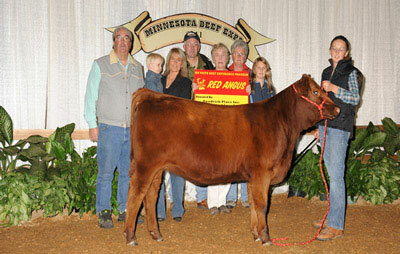 Alissa Mae Stai from New London, Minnesota, received the 2006 Red Angus heifer donated by the Goodrich Place Inc. on behalf of the Minnesota Red Angus Association. Tracy Tebben, Alissa's FFA advisor writes that "Alisa is a very responsible young lady who would give her animals the best possible care. She has worked hard to join her family in owning her own beef cows. This donation of a heifer would be an excellent start for this young lady's goal of owning a small herd of beef cattle." Alisa has three older sisters who have raised cattle and she would like to follow in their footsteps. However, due to some hardships, it has been extremely difficult to purchase an animal. In the future, Alissa would like to build her own herd and continue her education in agriculture. She may focus on beef production or genetic research. This is a hard working young lady who has done an excellent job with her heifer so far. 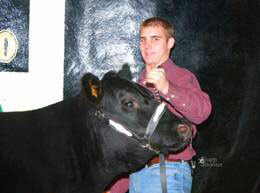 Andrew Scholtz from Comfrey, Minnesota, received the 2004 Angus heifer donated by the Goodrich Place Inc. on behalf of the Minnesota Angus Association. Andrew stated in his MYBEP application that "I am thirteen-years-old and just this past year I enrolled in the beef exhibit at my county fair for the very first time. I worked hard through the year with my animal, caring for it and learning different things from my dad about our beef herd. I was fortunate enough that my crossbred steer, which was home raised, made it to the State Fair competition. This was very exciting to me. Shortly after this, I received a phone call from our school FFA advisor informing me of this Youth Beef Experience Program. I was very excited because I have always wanted to own beef animals, just like my brother recently did. If I were to be selected to receive one of the heifers, I would feel so fortunate and this would give me a start in the beef industry. It would be an honor to work with an experienced purebred breeder to develop this heifer into a foundation for something I could build on for my own future." Andrew and the entire Scholtz family have become dear cattle friends, and we are proud of their motivation to be involved in beef production. Peter Heebink from Baldwin, Wisconsin with his heifer from GPI. We have known Peter since he was in his early teens and he was constantly asking questions about cattle, pedigrees and genetics. He's purchased several heifers and we are very proud of Peter's steadfast commitment to his small Angus herd. 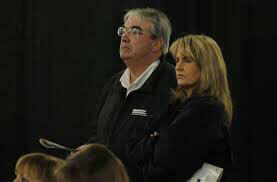 He also has donated numerous hours of his time in helping us at several of the Minnesota Beef Expo events. Thank you Peter.